You may never have considered taking your business to a trade show. 81% of people you’ll meet there will have buying authority. Oh, and not showing your face may see the perception of your brand fall 5%. Those should be some serious incentives. After all, choosing not to go is essentially like opting not to pitch your product to industry leaders, in favor of a damaged brand reputation. Still not convinced? Let us highlight the many further benefits of trade shows. Read on to be enlightened and grow your business! You have to take every opportunity to stay ahead in business. Trade shows are one method of doing so. Here’s why. Trade shows are like one big networking event. You may feel put off by the price tag involved. Indeed, costs can stack up with renting the floor space (this averages at $100-150 for large displays), setting up your booth, traveling between locations and paying for accommodation, etc. However, the long term financial benefits of the networking opportunity will easily make it worthwhile. For one, it’s easier to make a sale on the show floor (more on this later). But it’s also a fantastic method of making connections in your industry. You could develop B2B clients, and arrange partnerships that last for years, all from a single event. The trade show floor is awash with your direct competitors. Just as it’s good to keep your friends close and your enemies closer, it pays to keep an eye on your competition. These shows provide the perfect opportunity to see how and what they’re doing. Do some snooping. Speak with their salespeople. Learn from their example. Use the opportunity to compare your own business to theirs. See what you can learn from them, and what you’re doing better already. This should be a major incentive for smaller business owners. Going to trade shows can turn you from nobody into somebody in hours. No-one in your industry may have even heard of you before. This is your chance to make a name for yourself and stamp your claim on the market. Be sure to represent your brand professionally. Don’t skimp on your booth– invest a reasonable amount of money to ensure you come across well. Remember, you’ve got customers and clients with their eyes on you at all times. Its prime brand-identity-building real estate. Make the most of it. Say you’ve already been around for a while. You’re well-established and have a number of regular clients you do business with. Well, trade shows allow you to meet them in person and deepen those pre-established relationships. Business is built on relationships. You cannot overstate the value of nurturing the ones you’ve already got. Now, as opposed to swapping emails to exchanging calls, you get to speak face to face. That’s a sure fire way to solidify the business arrangements you have in place. You might even build upon current arrangements too. There’s nothing quite as daunting as a cold pitch over the phone. Even if you thrive on them, you have to agree that it’s harder to land a deal versus a warm pitch. Trade shows give you the chance to meet new potential customers. You have a natural advantage of being face to face. It’s easy to say no to someone over the phone. It’s far harder to refuse someone when you’re looking them dead in the eye. Moreover, people go to tradeshows to actively search for new products to invest in. Remember how almost everyone there has buying power? Well, that’s a salesman’s dream situation. People want to buy, they have the authority to do so, and they’re right there in front of you. Don’t worry if the sale doesn’t happen right there. At the very least you could stimulate enough interest to walk away from the show with dozens of new leads. From there, the calls going forwards will all be that bit warmer. It’s not often you get to meet your target market face to face. You might send out regular emails and surveys. But, as we all know, email marketing can be hit and miss. That’s especially true when it’s impersonal and underwhelming. Suddenly, at a trade show, you can engage face to face. Your brand gets a human touch. You can ask questions and seek feedback then and there. It’s convenient for all involved. Are you developing a new product? Do you want to trial it somewhere, before taking it to final production and investing significant financial sums? You don’t get many better opportunities than at trade shows. This is another bonus of having access to your target market. Ask them to engage with the product. See what they like and dislike. Check if it’s easy to use, or downright awful. Likewise, you’ve got other businesses to discuss it with. They might have tips and advice to help you on your way. Moreover, they might be interested in purchasing the finished product. We’ve already noted that trade shows can be expensive. We’ve also stated how it’s worth every penny in terms of potential ROI. That truth extends to the marketing potential provided by the show floor. More often than not, small businesses simply can’t compete with the marketing budgets of bigger companies. But that just isn’t a problem at trade shows. You can show your face right next to the giants of your industry. The playing field gets leveled. 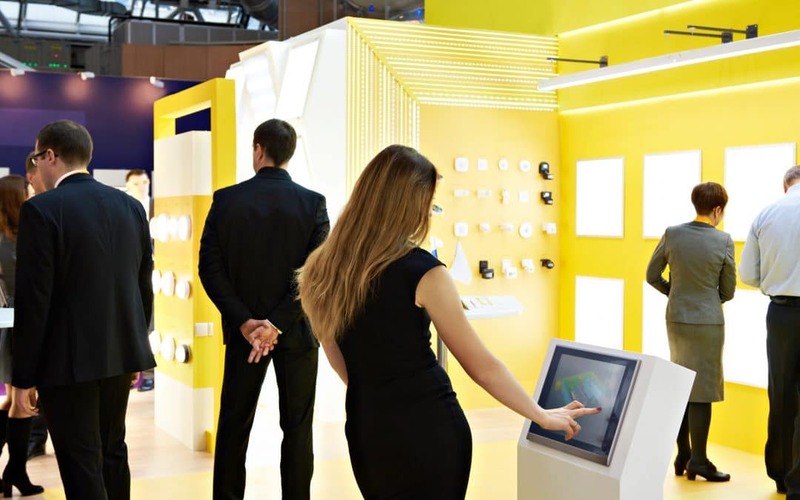 There you have it: the top 8 benefits of trade shows for your business. Trade shows offer epic advantages to any company that attends. As a result, opting not to attend them is downright bad for business. Hopefully, the information above has convinced to take your company along to the next trade show possible! Did you like this piece? Do you want someone to help you to create, set up and dismantle your booth? Contact us today to see how we can help.